Remodel your kitchen this holiday season! Have you been dreaming about a kitchen remodel? Fall is the perfect time to make the changes for your kitchen as you’ll have your updates before the holidays and will be able to show off your renovations to family and friends. Not to mention, making updates in your kitchen is one of the home improvement options most likely to improve the value of your home. As you make your way from dream to contractor, make sure to consider these four great tips for an on-trend kitchen you’ll love for years to come. There’s nothing quite as distracting from your stunning new backsplash than an outlet. Fortunately, there’s no reason your outlets need to stand out, or even be visible, with some creative designs they can be hidden in plain view. One option is to match the color of your outlets to the colors of the backsplash. This is perfect if you are unable to move the locations of your outlets. If you are able to move them, try adding your outlets to your under-cabinet molding, or you could even try ultra-modern pop-up outlets. The later is especially great for those kitchen appliances you don’t use every day – think immersion blenders and etc. – that would normally be stored out of sight. Even if you aren’t making drastic changes to the rest of your kitchen, updating your lighting is a great, easy way to make a huge shift in style without breaking the bank. We love using lighting to make a bold design statement as it allows you to show your creativity without the same level of long-term commitment that counters or cabinets may have. One of the most significant trends in the last two years and one we expect to continue well into 2020 is the use of hidden appliances. Your fridge and dishwasher may not be the prettiest, but if they’re still useful, there’s no need to replace them just yet. Hiding them with the use of matching paneling can create a cohesive, stunning kitchen without the expense of an update. When you’re beginning to plan, your kitchen remodel take time to consider the way you flow through the kitchen. If it is organized in an inefficient method, now is your chance to make changes. 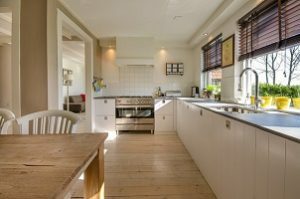 Often, storage is the biggest issue that homeowners face in the kitchen. Consider your current system and how it could be improved. Additionally, you may want to take a hard look at the flow from sink to prep area to stove to the fridge, often these four key points are not well situated for best use. This entry was posted on Friday, December 7th, 2018 at 1:44 pm. Both comments and pings are currently closed.